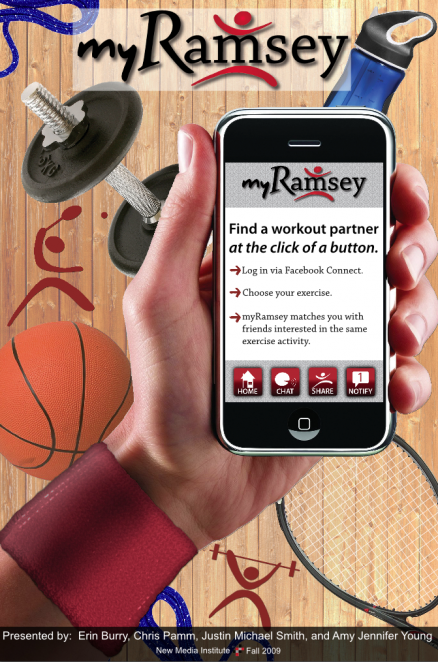 myRamsey is a mobile application, integrated with Facebook Connect, that allows students to choose their workout partner based on shared athletic interests at the click of a button. What Are We Changing? myRamsey is changing the social atmosphere that surrounds working out and/or going to the gym. Our application allows people to connect with their Facebook friends, some of whome they don’t have any interaction with outside of Facebook, through Facebook Connect. By matching people based on shared athletic interests through their already-existing social network, students can find better quality and more compatible workout partners, thus increasing their levels of physical activity. Having a solid workout partner will help to keep students motivated to workout and stay active. Why Can’t We Do It Today? As noted before, students don’t have face-to-face interaction with those in their social network on a regular basis. Most people have a handful of friends that they have weekly, or even monthly, levels of human interaction. The rest of their friends are communicated to via cell phones, text messages, e-mail or Facebook. When it comes time to workout, students are more-likely to turn to their handful of close friends as workout partners and/or motivators. If their close friends do not fulfill these needs, “said student” may be less motivated and less likely to workout. By connecting to their existing social network through Facebook Connect, students will be able to connect with those friends who they only communicate with electronically. These friends are not normally reached out to for working out, but they may share more athletic interests with “said student” than their handful of close friends. What Are the Benefits? By using our mobile Web application and finding a workout partner compatible with each individual student at the University of Georgia, students will become more motivated to workout, engage in the activities they enjoy and engage in more face-to-face interactions with people they would not normally interact with. The combination of these things will help students to lead more fir and healthy lifestyles. Additionally, our application will increase the number of people who attend Ramsey Center at UGA through peer motivation.